Within your website, you have a selection of predefined pages populated with property information which you can decide to use or to delete. If you have deleted one of the default Lodgify pages on your website you can simply restore it following the steps below. You can also create new custom pages and subpages from scratch or create links to a different website. Choose which type of element you want to add. 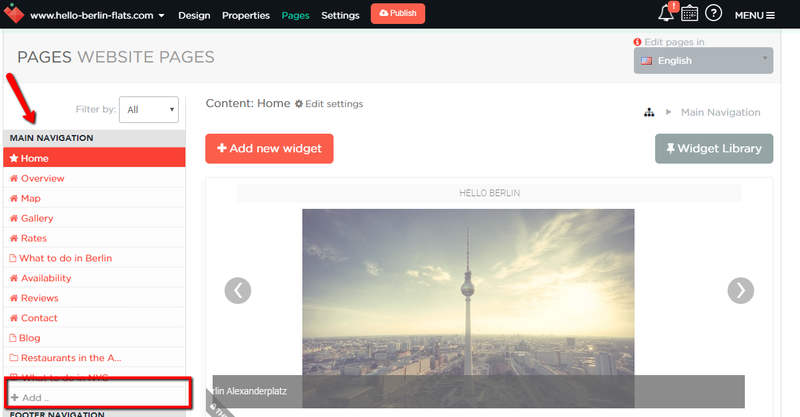 Page create an internal page which you can design yourself by using Widgets. Add a Page Title and Link Text. Or watch the video tutorial. Link create a link to an external page, e.g. your external blog. Add a Link Text and insert the URL of the external website you want to link to. 💡 Note: Default pages are Overview, Rates, Contact, Map, Availability, Gallery or Reviews pages. Select a House from the drop-down menu and choose which one of the default pages with Property info you want to restore. Folder create a new menu level with Subpages. 💡 Note: Subpages appear in a drop-down menu. Add a Folder link text and a Folder identifier. Then you can start creating pages which you drag-and-drop into the folder. Once you have added the new menu element you can simply drag-and-drop it to the desired location in your website menu. To find out more have a look at how to Reorder the menu.